"The only way we can end tribalism is for elders to form National Council of Elders that can speak with a unified national voice and speak up against ethnic targeting." Note from Jacob J Akol, Editor: Gurtong does not generally get involved in publishing or amplifying inter and intra ethnic conflicting views, for that would be very much against its uniting mission and objectives. However, this article by Kuir is a timely warning, not only to Uncle Ajou Deng, who has my sincere respect, but to all of us to be extremely careful and err, if err we must, on the side of the positive aimed at uniting our peoples. The historical corrections in this article are worth amplifying as I think they are as close to the facts as they can historical be. I’ve written a lot about elders acting like young people and young people acting like elders. This is embarrassing and it shouldn’t happen in any society. But this is sadly the reality in South Sudan where elders are the ones beating the drum of war and division while young people beg them to speak the language of peace,inclusion, and inter-tribal togetherness. Given the fact that the country is now in turmoil and risks descending into a genocidal mode asUnited Nations has recently warned, one can clearly see that elders and the senior intellectual class have lost their way. A number of young people, including this author, have been accused of targeting one self-proclaimed, infamous group of tribal elders’ whose language and agenda are divisive, abusive and myopic. These group, commonly known as Jieeng (Dinka) Council of Elders (JCE), came to political and public prominence after December 2013 mutiny and subsequent civil war. They became so vocal and tribally divisive that their writings and interviews became too hard to ignore. While supporters of JCE, most of whom tribally motivated, claim that these elders have both democratic and constitutional right to air out their views like any South Sudanese civil society groups, one needs to note the kind of messages they pass along and the motivation behind the existence of such a group. None of us would have much to say against JCE had they focused on Riek Machar and his politico-military activities without targeting Nuer and Tribes in Equatoria. Undoubtedly, these elders have every right to criticize Riek Machar or any political party they deem unacceptable given political affiliations they embrace. However, they have gone above and beyond what could be considered a democratic and constitutional right. They resorted to the denigration of non-Jieeng tribes in the states of Equatoria and the former Upper Nile region; something that is contributing to more hatred and tribal division. Vilification (as Anei did on his book tour in Australia) of other tribes, no matter the motivation, is not only morally wrong, it also contributes to national instability. Given the powerful role these elders play in government, and given the fact that the president is Jieeng, any denigration of Non-Jieeng tribes becomes inexcusable. I have written and posted videos as respectful as I could, urging these leaders to use their organization to bridge the gap between and among various tribes in South Sudan. And more importantly, I have also urged them to be the ones to advise youngsters against impulsive actions or tribally-charged utterances against other tribes. Surprisingly, there are people (including JCE) who accuse this author of having instigated hatred against Jieeng. Really? Asking my own people to be responsible and inclusive in order to avoid fueling tribal hatred is being considered, bizarrely, by some people as ‘garbage.’ That's really out-worldly bizarre. But no article, from JCE, has garnered much attention like the recent one by Uncle Aldo Ajou DengAkuey. Notable in the article is the divisive and abusive language, historical inaccuracies and a manner of speaking not expected of an elder statesman, intellectual and seasoned politician. Our elders, essentially, have lost their way. The first thing that horrified me and many others is the simplistic and embarrassing level the elder statesman has gone in his abusive and divisive language. I expected Uncle Ajou to correct young people he believes have gone astray without mentioning where these young people come from and without being abusive. Pitting different sections of Jieeng against one another is not advisable to anyone leave alone an elder and veteran politician. I have my critics and to some extent, ‘haters’; however, I have never resorted to calling them out by where they come from. I either call them out based on their own personalities or by their political affiliations. Tribes or clans are things I avoid when calling people out in terms of political differences unless I feel part of the group I'm calling out. The only people I have called out on clan basis are leaders from my own Jieeng section, the Twi of Jonglei state. Charity begins at home and that’s why I criticize leaders from my own sub-tribe or tribe. I cannot criticize leaders from other areas of South Sudan when leaders from my own tribe are at fault. Ajoudit could have criticized his young critics without referring to Jonglei or Bahr El Ghazal or any tribal associations for that matter. Besides, he could have also done so without calling them ‘foolish’ or people with ‘blocked’ minds who ‘skipped’ history in school. Where can we [youngsters] go if elders are the ones holding up the big, red flag of division and abusive language? It’s darn scary! It’s very true that Ajoudit has been in Sudan’s and South Sudan’s political arena longer than many of us have been alive. However, that doesn’t mean we should take his historical narratives as true at face-value. Like any learned persons, we need to fact-check his historical claims. This is neither to disrespect elders not is it an assumption that ‘one knows it all.’ We are educated to think for ourselves, to find out truth by ourselves. History is not formulaic. It’s usually twisted by people writing it to suit their sociopolitical or socioeconomic agendas as long as no one subjects their historical narratives to facts-check. Please fact-check all the historical incidences I’m citing here. 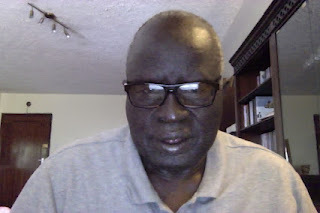 First, I have not seen anyone serious young South Sudanese person, who would downplay the contribution of the Jieeng of Bahr El Ghazal in the SPLA/SPLM war. Unless anyone wants to rewrite history, their contribution is both unquestionable and worthy of historical appreciation. All of us should call out anyone who believes that Jieeng of Bahr El Ghazal didn’t contribute significantly in the liberation struggle. Those of us who grew up in the SPLA/SPLM know the in-our-faces contribution of ‘mïïth ë Bar Ka Dhal!’ I even wondered, as a little boy in Itang Refugee Camp, if SPLA soldiers where mostly recruited from Bahr El Ghazal. It’s important that silly people should be dismissed with their silly, self-serving rewriting of history. Secondly, Dr. Riek Machar and Dr. John Garang finally reconciled in January of 2002 not 2001 as Ajoudit mentioned. A man who’s claiming that ‘we’ skipped history in school shouldn’t miss that simple fact. Ajoudit also claimed that the first major disagreement among South Sudanese was in 1983. However, Ajoudit knows very well, or he doesn’t know I’m not sure, that differences among South Sudanese preceded August 1983. It’s important to note that the first South Sudanese civil war had a dividing, ideological and tactical line between the military wing (Anya-Anya) under Emedio Teffeng and the political wing, Sudan African Closed District National Union (SACDNU) under Joseph Oduho (and later Aggrey Jaden). The party would later change its name to Sudan African National Union (SANU) in 1963 in Kampala. Between 1962 (when SACDNU was formed in Leopoldville, now Kinshasha) and February 1972 (when Addis Ababa agreement was signed) there were more than five political wings formed by different South Sudanese politicians. And these parties resulted from disagreements among politicians. Among these parties are SACDNU, SANU, Azania Liberation Front (ALF under Oduho - 1965), Sudan African Liberation Front (SALF under Jaden - 1965), Southern Sudan Provisional Government (1967 under Jaden and later Mourtat), Nile Provision Government (NPG under Muortat - 1968), Anyidi Republic (with Emedio Teffeng- 1969), Anya National Organization (ANO), Anya-Anya National Armed Force (ANAF) and Southern Sudan Liberation Movement (the latter three under Joseph Lagu). While Southerners managed at different times and levels to reconcile, differences were persisted and they were obstacles to the liberation struggle. It's also important to note that Emedio Teffeng and Joseph Lagu (then the Eastern Equatoria area commander until June 1970) didn’t see eye to eye. Lagu would later take over the overall leadership of the liberation struggle from both Muortat (of NPG) and Teffeng (of Anya Anya). And this ‘coup’ in our contemporary South Sudanese parlance, resulted from tactical and political differences. Another significant difference occurred when Joseph Oduho, the president of SACDNU, was detained in Uganda. William Deng Nhial used the party laws to suggest Oduho’s deputy (Marko Rume) as the interim leader. Father Saturnino objected for he wanted Natale Olwak as the interim leader. This would cause a disagreement when Father Saturnino accused Deng of trying to ‘divide Equatorians.’ Father Saturnino, as many historians have noted, had a knack of siding with Oduho against Jaden, who'd later lead SANU and SSPG (for a short period). Another significant difference occurred in the March of 1965 at the Round-Table conference between SANU-Inside of Deng Nhial and SANU-Outside of Aggrey Jaden. After the military government of Abboud ended with resignation in 1964, William Deng (and many Southerners too) believed that they could work with the new government of Sirr Al-Khatim Al-Khalifa. At the Round-Table Conference, Deng settled for a federal system within a united Sudan. However, Jaden stuck to his guns and demanded a total independence of South Sudan. All these formations and divisions affected the liberation struggle in a very significant way. The wrangling among politicians didn’t help Anya Nya I soldiers for there was no proper, unified political leadership to steer the liberation struggle. So to say that the first time differences among South Sudanese came up is 1983 is not only misleading, it’s historically inaccurate. South Sudanese have always disagreed and formed different political parties just as they would do after 1991 Riek-Lam rebellion. This is what Bona Malwal, a member of JCE, wrote in his book:, Sudan and South Sudan: From One to Two. "Unfortunately, [William] Deng took the same position most South Sudanese politicians take in the face of internal debate and exacerbated the split within the Anya-Nya Movement. Political debates in South Sudan never end in consensus building - it ends in further splits. Feuding South Sudanese politicians never take time to reconcile their opinions with those who disagree with them. Everyone insists on being right and having their way. As an elder and veteran politician writing to the younger generation, it’s advisable that Ajoudit be as explicit and as accurate as possible. Not all of us are push-overs. And certainly, not all of us would take your words as you write them. Not all South Sudanese ‘embraced’ the agreement. Even those who accepted the agreement were just tired of war. The implementation of the agreement itself had problems as early as 1973 when some Anya-Nya forces decried the way they were being treated by the Sudanese army. The same disagreement and dissatisfaction led to the Akobo mutiny of 1975 by Vincent Kuany Latjor and Bol Kur Alongjok. So it’s irresponsible for a veteran politician to mislead young people by presenting inaccurate historical facts. Perhaps it’s time for Ajoudit to refresh his mind by reading a number of books, even those written by his own colleagues. Both Jieeng of Jonglei and Jieeng of Bahr El Ghazal are noble people, who’ve contributed very well to the liberation of South Sudan alongside other tribes in South Sudan. There’s no point in creating unnecessary antagonism between them. JCE was supposed to unite Jieeng people but it now seems to be resorting to its very division. The only way we can end tribalism is for elders to form National Council of Elders that can speak with a unified national voice and speak up against ethnic targeting. These various tribal ‘council of elders’ and their tribe-centered writings and agendas lead to more tribal division. Unless these tribal councils are engaged in socially important issues, their political meddling and ethnically-charged language are only fueling tribal divisions and disintegration of South Sudan. When Dr. Lam and Dr. Riek rebelled against Dr. John Garang, they didn’t have any special name change because they thought they were merely removing Dr. John in order for them to remain the leaders of a ‘democratized’ SPLA/SPLM. However, to differentiate Riek’s group from Garang’s group, the two sides were referred to [informally] as SPLA-Nasir and SPLA-Torit respectively. Riek and Lam would later change their name to SPLA-United in 1993. When Riek decided in their Akobo convention that SPLA-United be renamed Southern Sudan Independent and Army(SSIM/A), Lam didn’t go with it and decided to remain with SPLA-United by proclaiming himself the leader. It’s therefore crucial for an elder and an intellectual to be explicit about historical facts instead of merely throwing out historical facts in an irresponsible and misleading manner. SSIM/A wasn’t formed in 1991 but in 1994 leading to the disagreement between Lam and Riek, the disintegration of SPLA-Nasir group, and their eventual journey to Khartoum. It looks like a role-reversal has happened in South Sudan. I am appealing to our elders and senior intellectuals to stop tribal hate speeches and self-praise. History has been documented and we all know who did what, how, when and where. We shouldn’t use our contributions during the liberation struggle to divide the country and tribes. I would advise elders like Ajoudit and all the members of JCE, to start uniting the country instead of being agents of division. You don’t have to tell us your historical contributions - or lack of them - because we all know them. Pitting Jieeng of Jonglei against Jieeng of Bahr El Ghazal is something that shouldn’t come from elders. If young people are the ones cautioning elders against being divisive, then what values are we left with? We are screwed, as we'd say in North America! The interviews JCE members conduct with SBS Dinka Radio are horrifying. They are divisive and dangerous for the future of South Sudan. Whether it was Ambrose, Ajou, Joshua Diu, they are all horrendously divisive, short-sighted and conspiratorial. Unfortunately, this is the divisive language Ajoudit is now using to divide Jieeng people. It’s possible for Ajoudit to criticize a few individuals without pitting different sections of Jieeng against one another. I have always criticized JCE without accusing any one section of Jieeng. Whatever one section of Jieeng does, it affects all of us. Incitement of the neighbors of Jieeng of Jonglei should not come from an elder. As I have always reiterated, JCE needs to reach out to other tribal elders in order to bridge the tribal divide instead of resorting to not only dividing different tribes but also dividing Jieeng itself. What has become of our elders? PS. Dr. Majak D’Agoot and Madam Rebecca Nyandeeng are politicians and they should be treated as such not members of Jieeng of Jonglei. They can carry their own cross as individuals.